The Dunkirk evacuation refers to the evacuation of Allied soldiers from the beaches and harbour of Dunkirk, France, between the 26 May and 4 June 1940. It was run by Admiral Sir Bertram Ramsey and was code-named ‘Operation Dynamo’ because it was run out of the old dynamo room at Dover Castle. After the Germans had invaded Poland in September 1939, the British Expeditionary Force (BEF) was sent to aid the defence of France. For months nothing happened and this period became known the ‘Phoney War’. However, Germany began their invasion through the Netherlands and Belgium on the 10 May 1940 with Army Group B and with a main Panzer thrust through the Ardennes. They rapidly reached the coach at Abbeville and by 21 May had trapped the BEF, the remains of the Belgian forces, and three French armies in an area along the northern coast of France. 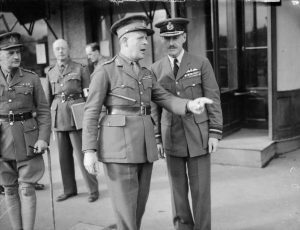 The commander of the BEF General Lord Gort (John Vereker, 6th Viscount Gort, pictured left), immediately saw that an evacuation across the Channel was the best course of action and began planning a withdrawal to Dunkirk, the closest location with good port facilities. It also had good beaches and was surrounded by canals which would act as a defence against the Germans. On 22 May 1940, a halt order was issued by the German High Command stopping the Panzers when they were within reach of Dunkirk. Many believe this order to be issued by Hitler when it was in fact issued by von Rundstedt who did not want his tanks to outrun the infantry and believed that they needed to rest for the coming battle of France. This halt order gave the trapped Allied forces time to construct defensive works and pull back large numbers of troops toward Dunkirk, to fight the Battle of Dunkirk. From 28 to 30 May 1940, the remaining 40,000 men of the once formidable French First Army fought a delaying action against seven German Divisions of which three were armoured. Lord Gort had also put in place a number of stops. These were towns that would be occupied by battalions of the BEF and would slow the German advance. At the commune of Le Paradis on 27 May, soldiers of the 2nd Battalion Royal Norfolks became isolated. They defended a farm house until their ammunition ran out and then surrendered. The Germans they surrendered to were members of the SS Totenkopf Division. The Germans led them across a road to a field and then into a farm yard next to a barn wall (pictured left). At that point machine guns opened up on them. 97 troops were killed in this massacre but two survived, Privates Albert Pooley and William O’Callaghan. They gave evidence after the war at the trial of the SS officer, Fritz Knochlein who was hung for war crimes. This was not the only massacre committed by the SS. 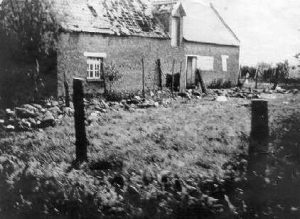 At Wormhout on 28 May SS soldiers of the 1st SS Liebstandart SS Adolf Hitler Division put almost 100 British soldiers, mainly from the Royal Warwickshire Regiment, into a barn and threw in stick grenades. They them began to shoot the survivors five at a time and finally open fire with machine guns into the barn. Some managed to escape but in total 80 soldiers were murdered. On the first day of the evacuation only 7,669 men were rescued, but by the end of the eighth day, a total of 338,226 soldiers had been rescued by a hastily assembled fleet of over 800 boats. This is largely due to Captain William Tennant. Tennat was sent to Dunkirk by Admiral Ramsey to organise the evacuation. As the ‘Senior Naval Officer’ he noticed the Eastern Mole, a wooden break water at the harbour and from here many of the troops were able to embark onto 39 British destroyers and other large ships. 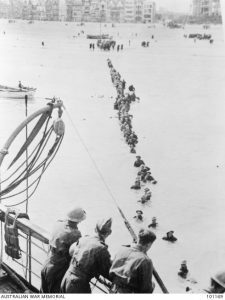 Others troops had to wade out from the beaches and wait for hours in the shoulder-deep water before being ferried to the larger vessels off shore by their ‘whalers’. This was speeded up by the ‘little ships’ of Dunkirk. 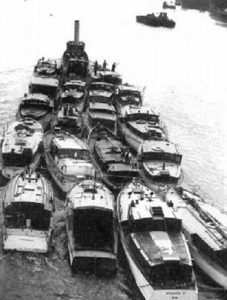 A flotilla of civilian pleasure craft manned by their owners and aided by naval personnel. They crossed the channel and ferried the waiting soldiers to the larger ships. Many other vessels took part. These included merchant marine boats, fishing boats, pleasure craft, and lifeboats. All were called into service for this emergency and their efforts saved an army which would go on the fight in North Africa, Italy and eventually on the beaches of Normandy when we launched the invasion of Western Europe. The BEF lost 68,000 soldiers during the French campaign and had to abandon nearly all of their tanks, vehicles, and other equipment. In his speech to the House of Commons on 4 June, Churchill reminded the country that ‘we must be very careful not to assign to this deliverance the attributes of a victory. Wars are not won by evacuations’. The events at Dunkirk remain a prominent memory in the United Kingdom. But was it a miracle? A miracle is the act of divine intervention and certainly a number of things went in favour for the British. Firstly the ‘halt order’ and small vessels that helped liberate an army. However if there was an act of divine intervention it was the weather. For the entire period of the evacuation the channel was calm. In fact, a storm that was due to enter the English Channel swung north into the Irish Sea.